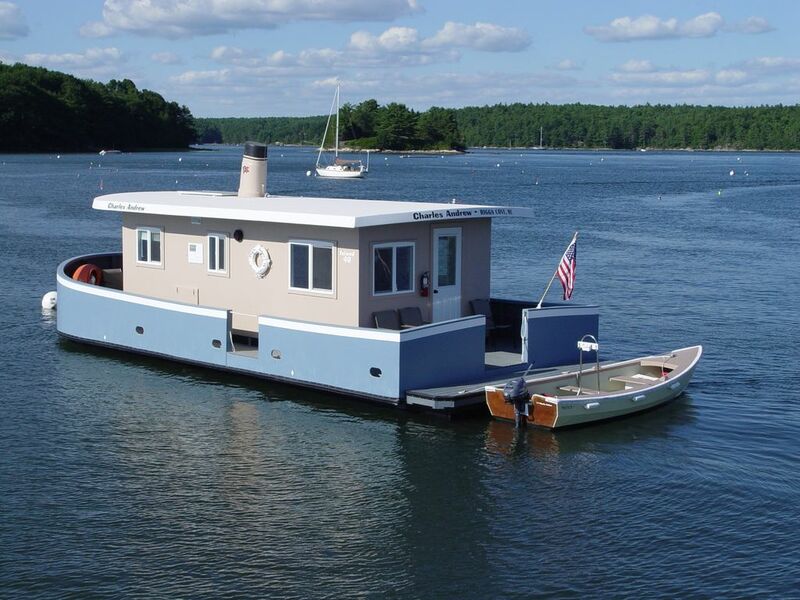 Charles Andrew joins Tessie Ann (HA 285122) and Nancy Lou (HA as part of a fleet of non-powered houseboats moored in Riggs Cove by Riggs Cove Rentals LLC at Derecktor Maine LLC, a full service marina in Georgetown, Maine. Charles Andrew has accommodations for five and is accessed by way of the included 16' skiff with 6 hp motor which can also be used to explore the coves and islands within the cruising area. Leisure, peace, romance and, best of all, no boating experience required! Three night minimum stay required. A Romantic Getaway: The full bulwarks (high sides) of our houseboat Charles Andrew provide protection from the wind, but better yet, virtual seclusion while lounging on deck. Levolors on all the windows provide privacy at night, and shade during the day. Cook on board with the three burner propane stove and oven, or go ashore to the Anchor Bar and Grill on the Derecktor Robinhood Marina site. Our Beautiful Setting: While you're swinging on a mooring in Riggs Cove, ospreys nest nearby and dive for fish, seals bob by, lobster boats work their traps, and sailors and yachtsmen arrive and depart to and from ports unknown. A glass of wine, a good book, your best friend(s), 360 degrees of water views. Cool nights? Two marine Fireplaces. Too much sun and salt? Walk in shower with on demand hot water. A little more than life at sea. Gunk holing, adventure and remembering: exploring with the skiff or the 2 kayaks on board along the miles of shoreline in the cruising area. There's history here, sea people, traders, fishermen, boat builders. Want to come? Three night minimum stay required. The Charles Andrew, Tessie Ann (Home Away 295122) and Nancy Lou (HA 3546511). No smoking, no pets. Three night minimum rental. Loved it. Very clean and had all the needed essentials. we were able to buy lobster right from the fishermen in the harbor. We saw lots of wild life and a seal popped up around the houseboat through out the day most every day. It was comfortable and we'd love to come back and stay again. Staff was very friendly. Doug did an excellent job aquainting us with the boat's features. Boat was clean and comfortable. Saw seals, a shipwreck and more stars at night than we could imagine. Enjoyed kayaking, sailing and swimming. This is the 6th time I have rented one of their boats and Illbe coming back. Saw so much wild life activity, great spot for visiting tows. Staff is excellent and very helpful. Boat is spacious and relaxing. Our summer home away from home! This was our 7th time on the houseboat and it never disappoints! Peace, tranquility, beauty, seas, spectacular sunrise/sunset and a restful time away! Can't wait to return! Great quiet location. Staff were very helpful. Use of the small boat to get to the house boat and explore the harbor and river was a great addition. We were lucky with perfect weather. Highly recommend for a weekend get away. Our Labor Day weekend aboard the Charles Andrew exceeded all expectations. The boat is new, well appointed and perfectly maintained, all amenities are as advertised. During the day we explored under power, paddle, sail. . . Evenings we enjoyed great dinner at the boatyard restaurant (with full bar), watched a movie aboard and did some reading. Kids had a blast boating, fishing, watching seals right from their berth, etc. most important, the boatyard staff are delightful people who bent over backwards to make sure that we were having a great time. We strongly recommend this venue if you are looking for a memorable vacation. On Georgetown Island in mid-coast Maine, Robinhood Marine Center is a full service marina with slips and moorings to accommodate vessels up to 65 feet. Our Island 40 rental program, initiated in 2010 with Tessie Ann (Home Away 295122), is a means for people with little boating knowledge to experience the peace, beauty and wonder of life on the rivers, coves and bays of Maine. check in time is after 3:00 pm and before 6:00 pm (Briefing required) check out time is 11:00 a.m.